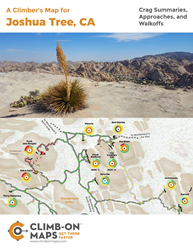 Rock climbers are excited about the new Joshua Tree, CA Climb-On Map - a unique rock climbing approach and walk-off trail map that unlocks the vast labyrinth that is Joshua Tree National Park. The Climb-On Maps Kickstarter began on January 31, 2018 and was funded within 36 hours. The Kickstarter continues until February 28, 2018 with big discounts. On the morning of January 31, 2018, Climb-On Maps began its Kickstarter to launch their latest map, the Joshua Tree Climb-On Map. Within 36-hours the Kickstarter was fully funded! Large rock climbing areas like Joshua Tree, CA are known for navigation challenges which can significantly impact the quality of a climbing trip. A few hours to a full day can be lost just looking for a climb. To avoid getting lost, many people end up going to the standard, easy-to-find climbing wall, but then have to wait in line to hop on the rock. Neither scenario results in the primary goal of the trip, which is to climb. + Climbers can easily plan their day using the Crag Summaries. Crag Summaries mark the location of each wall and use color-coded charts that allow climbers to rapidly determine whether a wall will work for them. The Crag Summaries offer the most comprehensive assembly of crag information available and includes the number of climbing routes, the distribution of climbing grades, climb types at each wall, and the number of aid and multi-pitch climbs on a wall. Because of Joshua Tree’s long climbing history and variation in climbing grades, Climb-On Maps has created special Joshua Tree crag summaries that also show the proportion of climbs rated at 5.7 and below (this is in addition to the categories 5.8-5.9; 5.10-5.11; and 5.12+). The Kickstarter ends on February 28, 2018 and is offering significant savings on all of their maps (Joshua Tree, CA; Red Rock Canyon, NV; and Smith Rock, OR). The earlier the participation in the Kickstarter, the more the savings. If the stretch goal is reached, then Climb-On Maps with be able to release their 4th area, City of Rock, ID, more quickly. Climb-On Maps was started by husband-wife team Stefani Dawn and Rick Momsen. To date, Rick and Stef have walked over 1800 miles, some of which was quite dangerous, to collect the data for these maps. Getting boots-on-the-ground data is the ONLY way to make a map like this.